Explore color and light by viewing an amazing soap bubble up close and personal with this awesome experiment from Beakman and Jax! Beakman and Jax calls the results a "gorgeous miracle!" 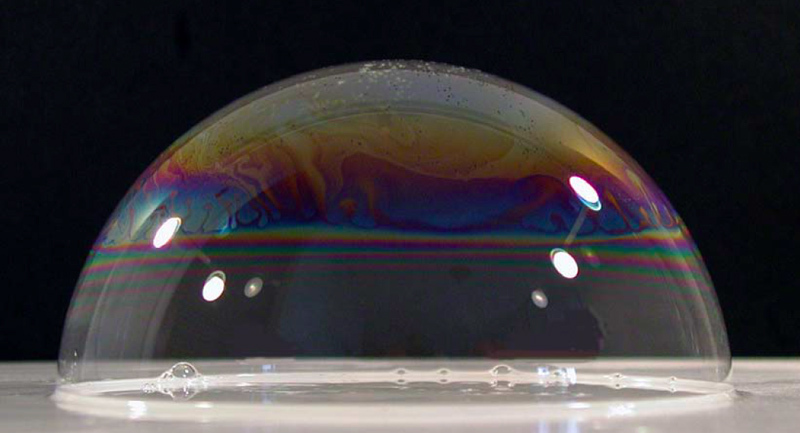 By holding the flashlight underneath the bubble, the bubble will illuminate with squiggly lines of a variety of colors covering the entire bubble. how to: Mix 2 tbsp of soap into 1/4 cup of water. Go into a dark room (as dark as possible!). Stand the flashlight pointed upwards. Place the lid upside down on top of the flashlight. Pour enough solution to cover the bottom of the lid. You should have soap solution leftover. Wet the straw into the extra solution. Turn the flashlight on. Then, blow one large bubble on the lid with your straw. Be prepared to be AMAZED! Visit Exploratorium for the scientific explanation. Visit Chymist (featured above) for a full list of bubble activities, including: bubble basketball, unbreakable bubbles, catching bubbles, bouncing bubbles, put a friend inside of a bubble, blow a bubble inside of a bubble, color fringes in a bubble, tabletop bubbles for measuring, and dry ice bubble experiments (including rainbow dry ice bubbles)!